This stamp set is one of a few made by Close to My Heart that are designed specifically to create quick and easy cards. For this particular stamp, I chose to separate the words and the butterflies by cutting the stamp so that it is now two. I can now stamp them separate or together. I will often do this with my stamps. 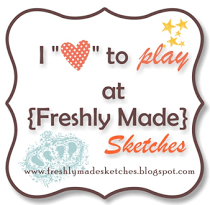 It is a great option with acrylic stamps but you do have to be careful. You will want to cut in one single, smooth cut so that it won’t later rip and you need to be careful that you do not cut too close to the image that it won’t stamp correctly (or that you cut into the image itself). This one was more difficult because they were close together. I decided to risk it because I knew I would use the stamp more with just the butterfly (and I’m not big on masking). In the places that were close, I focused on the butterfly image so that if it didn’t work I would have that part. It ended up working just fine! I think this is the closest one I have cut. Supplies used are all Close to My Heart: Perfect Day Paper Packet (retired), Quick Cards – Butterfly Stamp set, Sorbet ink, Opaques Pearl Adhesive Gems, Colonial White Grosgrain Ribbon, and Colonial White and Black cardstock. This was a very quick card that would work for just about any occasion. It took me a total of 15 minutes from the time I decided to make the card to completion. You can’t beat that!